SEOmoz, Cognitive SEO and Feng-GUI are sponsoring the SEOROI contest for SEOs to share their most creative and powerful tactics. Interaction-Design.org is all about making research accessible. We deal with human-centered aspects of technology: Interaction Design, User Experience (UX), Human-Computer Interaction (HCI), Information Architecture (IA), Human Factors, Usability, and related fields. We are happy to announce that Feng-GUI visual attention service is featured at interaction-design.org with a discount for site members. 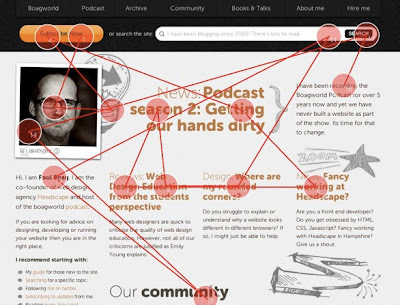 Paul Boag podcast and article about the big decisions designers face and how to solve them. One of the visual design elements is Flow and Paul is demonstrating how to use Feng-GUI attention analysis to evaluate the gaze path of the eyes which will view your design. A grid provides structure, however by itself it is not enough. The user’s eye has to be drawn around the page until it alights on the various screen elements we need them to pay attention to. In other words their eyes need to flow from one item to the next. Creating flow can be achieved in lots of different ways. On boagworld.com I used colour, faces, illustrations and typography to make sure users were looking at the right items in the right order. Paul Boag is the co-founder of the web design agency Headscape and host of the boagworld podcast.